I’m in the midst of developing the next phase of my training before the triathlon season, but I’m since I’m not finished yet, I thought I’d share a little discovery with you. 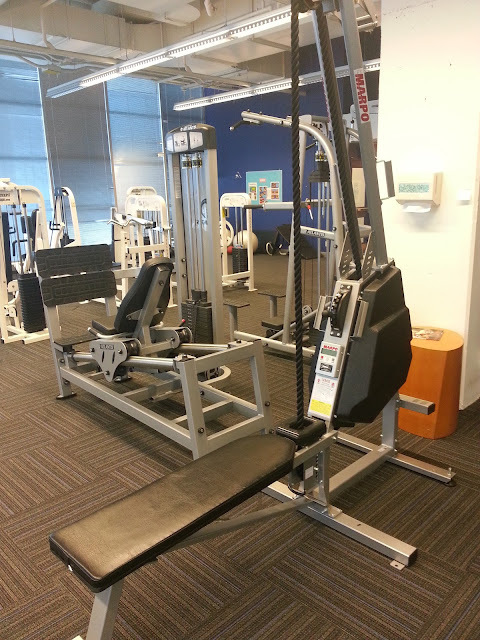 This machine [add official name] was added to our corporate gym at the end of 2012. The rope is looped so it can be pulled continuously. 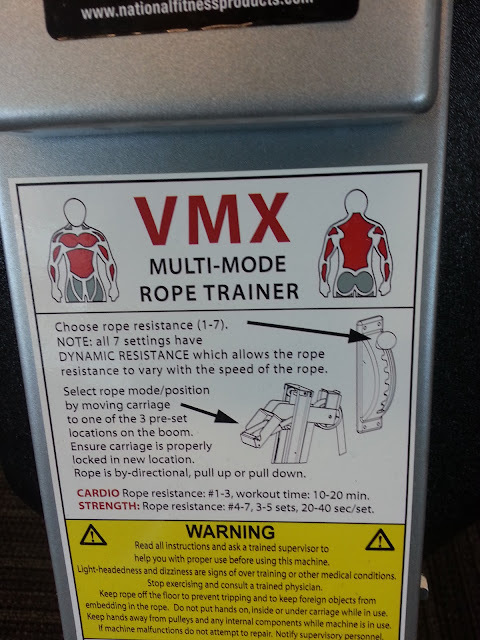 The arm (that houses the pulley at the top of the rope loop) can be tilted to allow a more horizontal type pulling, but most people seem to be using it in the configuration shown. The instructions say to use Rope Resistance Level 1-3 for 10-20 minutes as a cardio workout, and the levels 4-7 for 20-40 seconds (in 3 to 5 sets) as a Strength workout. I was excited about using it to increase upper body strength and endurance in general, but the specific motion of climbing up the rope (pulling down)is very important to me: 1.) it’s a lot like a front crawl stroke so I figure it can pay dividends to my swim 2.) it’s going to strengthen my upper back and the supporting muscles which are my biggest weakness (I can’t do pull-ups, and even hanging from a bar feels hard to me). The first few times I used the machine, I mostly did a 1-minute session on one of the harder settings (6 or 7) as part of the endurance phase of a Matrix circuit. Then someone offered me a challenge. Apparently some of the runners were doing a pyramid style workout with the machine: 1 minute pulling the rope up (like you were pulling a bucket up from the bottom of a well), 1 minute pulling the rope down (like you were climbing it) - on the hardest setting. Drop the resistance down a level, then repeat. This continues until you’ve done both directions, all resistances for a 14 minute workout. Then you record the distance travel in meters, which is available from a little readout in front of the bench. So far, I’ve recorded 582 meters and 605 meters... the record is 784! What’s the new/crazy apparatus at your gym? Love or hate?